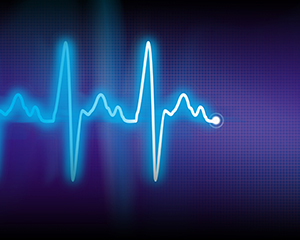 An echocardiogram is a test that uses high-pitched sound waves (ultrasound) to produce an image of the heart. The sound waves are sent through a device called a transducer. The sound waves travel through the chest and bounce off the heart creating echoes which are captured by the transducer. These echoes are converted into moving pictures of the heart that can be seen on a video monitor. What information does it provide about the heart? During the test you will be asked to remove your clothes from the waist up and wear a gown You will then lie on your back on an exam table. Sticky patches or electrodes will be attached to your chest and shoulders and connected to electrodes or wires to record the electrocardiogram (EKG). The technician will apply a clear gel to your chest which helps transmit the sound waves. During the exam you may be asked to hold your breath or take deep breaths. You may also hear a “whooshing” sound which is the sound of the blood flowing through the heart. Do not eat or drink for three hours prior to the procedure. Diabetics, particularly those who use insulin, will need special instructions from the physician’s office. Your physician may instruct you to stop specific heart medicines one or two days prior to the test. Wear comfortable clothing and shoes that are suitable for exercise.